Hand Woven Raw Silk Tallit with Embroidered Atara CAT# TSW- 2. hand – woven, including the colored stripes. The Blessing in the Atara is embroidered. It says: “Asher Kidishanu Bemitzvotav Vizivanu Lehitatef batzizit”. Sizes: 19” X 71”. The tallit katan, or "small" tallit, is worn for the duration of the day by many Orthodox and some other observant Jewish men. While it should not be worn directly on the skin, it is often worn beneath one's shirt (yet above an undershirt). However, chasidim tend to wear them on top of their shirts, under a suit vest. 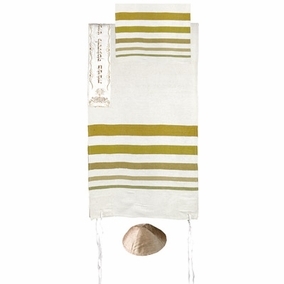 A tallit katan can be worn during most occasions, though there are some restrictions, for example one should "tuck-in" tzitzit upon entering a graveyard.